Fenugreek is an exotic and unique spice used widely in the Indian kitchen. This healthy ingredient is used by them for thousands of years, considered to be one of the best body coolants. Fenugreek plays a vital role in Indian Traditional Medicine. Furthermore, even now this is one of the spices widely used in many home remedies. And commonly stocked in North Indian as well as South Indian pantry. The entire plant is edible and included in the everyday cooking. Fresh leaves, dried leaves and the seeds are used extensively to make various menus. These are used as the main ingredient, seasoning or garnishing. The dried leaves of fenugreek play a prominent role in the North Indian cooking, which is mainly used for its flavor. Even a small quantity of dried fenugreek leaves burst the dish with the beautiful aroma. Usually added at the final garnishing stages. The Fresh greens are commonly used throughout India. Fresh greens are usually combined with lentils and served with roti or rice. The leaves, lentils, and rice make a wholesome dish with protein, carb, and essential nutrients. This method of preparation is called methi dal in Hindi and vendhaya keerai kootu in Tamil. You may also try this methi biryani, or Gujarati Muthia which uses fenugreek leaves as the main ingredient. The seeds are used generally for seasoning. Fenugreek seeds are tempered with cooking oil before adding to the dish. The ancestors of India considered this seeds as sacred and included in almost every recipe. This is a good source of dietary fiber, protein, iron, manganese, and magnesium. This has got great anti-inflammatory properties. A great home remedy for the heart burns, stomach sours and simple stomach aches. 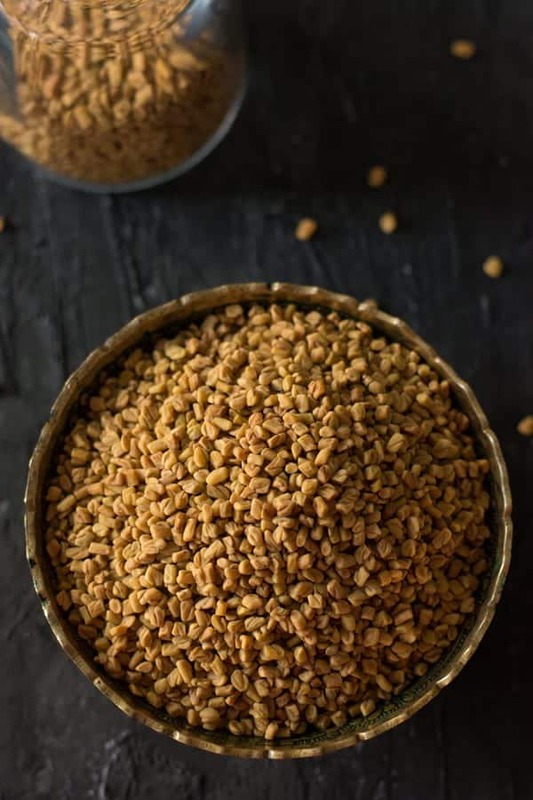 Since these fenugreek seeds have got body cooling properties, my mom makes sure that we include mainly on the summer times. On the hot summer, we soak these seeds overnight. Next day morning, we add this to thin buttermilk and drink in an empty stomach. This is the excellent home remedy for the simple problems arises because of the hot weather. Most recipes call the whole seed. You may sizzle it in cooking oil along with mustard before adding. This is bitter, so be cautious in deciding the recipe before you add. If you want to use fenugreek seeds in other than Indian recipes. You may use ground fenugreek seeds. These seeds are bitter, so a little quantity, say quarter teaspoon will be good for a dish for two people. The generous amount can turn the food bitter and spoil the taste. This is a simple task if you have a spice grinder or mortar and pestle. The first step is dry roasting. For this fry them in low to medium flame until they slightly change its color and aromatic. Secondly, allow it to cool. Finally, grind it in the spice grinder or the mortar and pestle. These are available in any Indian or Asian stores. Alternatively, you may also get them in the specialty stores like Wegmans or Whole Foods. On the other hand, you can get it in the online stores. Fenugreek seeds are called vendhayam in Tamil. Menthulu in Telugu and methi in Hindi. It is called in different names in different regions. And these are the some of the essential translations in the region translations. Many of the readers ask for the substitutes, but unfortunately, I am unable to find any closer replacement. Finding an alternative is hard for a specific spice which is known for its uniqueness and has a distinctive flavor. So I incapable to recommend any other closely related spices as a substitute, as every spice has its own medicinal and nutritional values which is highly complicated to find the substitution. So if you do not have fenugreek for the particular recipe skip using it rather than substituting with another ingredient, which you may end up in making the whole new, different dish when comparing the original.